With all the Merle Norman products I've grown to love, I have never tried their brushes. 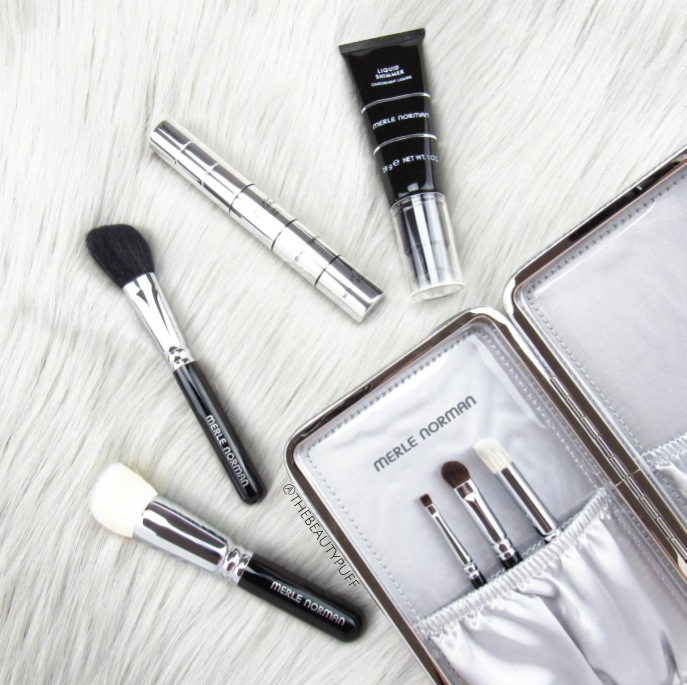 Over the holiday season they came out with a gorgeous Limited Edition brush set which features some of their must-have brushes with travel-sized handles. The brushes themselves are full-size but the shorter handles give them a lot more versatility which I love. In this post we'll go over the different styles of these versatile brushes. Face #5 | The fine bristles of this angled brush are great for applying light layers of blush to the cheeks. I would much rather build up color than apply too much at once! This is a great shape and size for blending almost any powder product. I love it combined with the Merle Norman Contour & Highlight Duo personally. Face #7 | This is just one of many multi-taskers in the Merle Norman brush line. This angled stippling brush has a combination of natural and synthetic hairs making it ideal for any makeup formulation. Liquid, powders, creams, you name it. The outer bristles are slightly shorter and the variation gives a beautiful, flawless finish. Face #8 | A densely packed concealer brush is a must. This angled brush gets into any hard to reach spots with ease and features synthetic bristles for easy application and cleaning. I like that this brush is small enough for detailed application but also large enough to work product under the eyes as well. Great for travel too. Eyes #4 | I love how easy this shadow brush picks up color. The angled shape fits perfectly in the crease and also works to blend color on the lid or brow bone. This style is really a must-have multi-tasker. Eyes #5 | A tiny detail brush another great tool to have in your makeup brush collection. This eyeliner brush features natural bristles with a flat cut for precise application of shadow, liner or brow products. I like using it for gel eyeliner because just the right size to apply product on the lashline. Want to find more Merle Norman products? Explore their website and find your nearest Merle Norman Studio below!